You want to bring home more gifts to mom than your dorm laundry bag filled with dirty laundry. When it's the holiday season, you also want to put together a cute and thoughtful present for her. You don't want to just place it in a plastic bag and hand it to her, either. Make sure you go the extra mile and wrap the gift nicely and impress her by adding a bow made from our Magenta Glitter Ribbon! Just don't place this dorm essentials item on your dorm laundry bag for her - she may not be as impressed with that! Of course, this dorm necessities item can also be used on gifts for the rest of your friends and family and it can even be used in your dorm room decor! 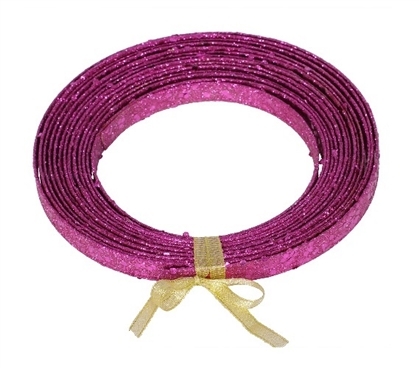 Our Magenta Glitter Ribbon is a thick, sturdy ribbon with a bright Magenta color and magenta glitter. The thick and sturdy design of this dorm necessities item make it great for both gift wrapping and adding to your dorm room decorations. Plus this dorm essentials item is so versatile you can really use your imagination for how you place it in your college dorm room. You can wrap it around your dorm Christmas tree in addition to garland or you can even tape it to your college dorm room door so everyone on your residence hall floor can see how much holiday spirit you have.